From January 2014 we received another hand-made parcel of tapes from Rinus Van Alebeek and his Staaltape Label. As ever, even the parcel you get from Rinus is a work of art. I only just opened the parcel today. 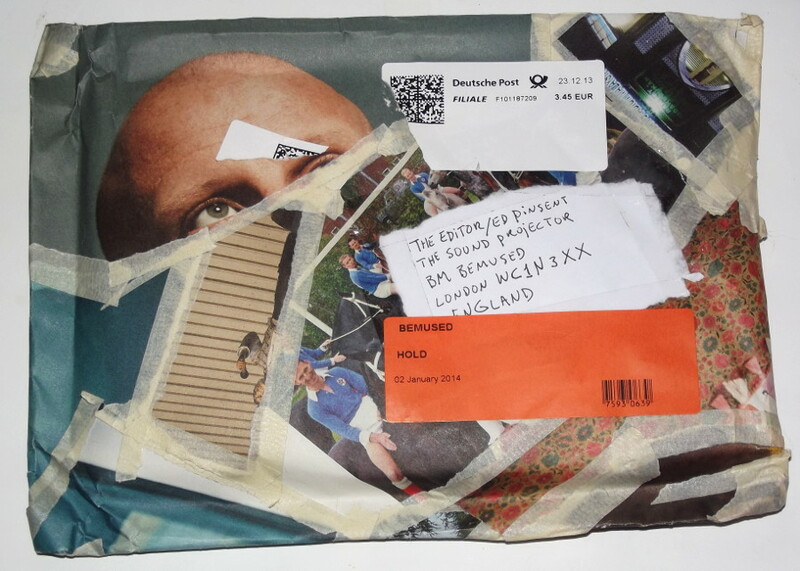 In an accompanying note he asks whether the contents can be reviewed in conjunction with his previous missives, referring to his package of January 2013 which we noted here. I haven’t been able to fulfil his commission to the letter, but if you read both these posts in sequence we might arrive at the hoped-for “inclusive” effect. First item is Ranch. 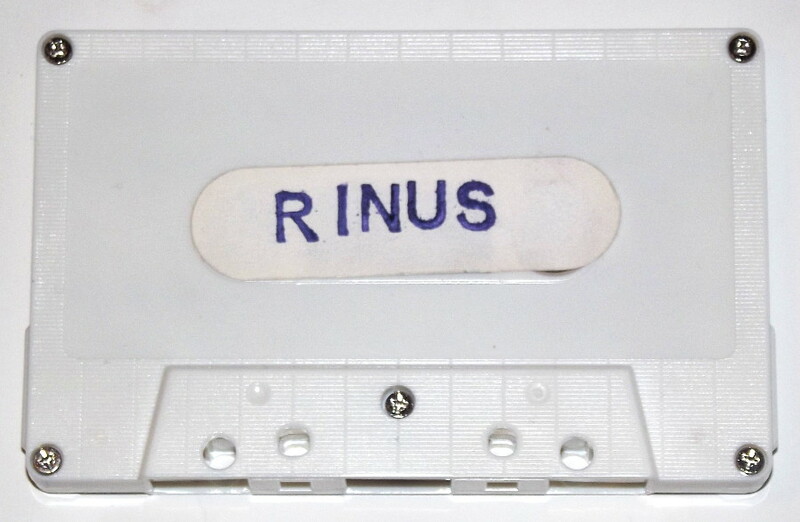 This is a solo tape by Rinus Van Alebeek. As you can see it’s housed in one of those nice chipboard folding wallets that are all the rage for cassette tapes just now. So much better than a plastic shell. The cover is hand decorated with a pencil rubbing, revealing a silhouette of a dapper fellow in profile wearing a trilby hat or such. He might be Joseph Beuys, or an allusion to that artist and his important works. 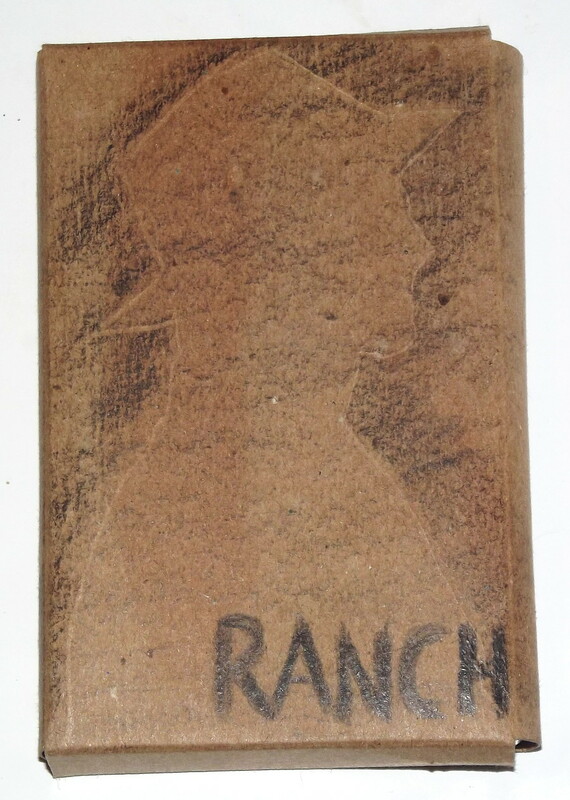 The subtitle of Ranch is “Stories From The West Coast”, and the A side so far does indeed convey an episodic sensation redolent of fractured story-telling. I used to have dreams in my younger days when I was able to wake up in the middle of an exciting adventure, then fall back asleep and continue the next instalment. Dream-continuity. Could be that Rinus approximates this state by his use of mixed sources: recorded sounds, tapes found in old tape players, or tapes simply given to him by others. I can well believe that when your life revolves around recorded sound, many people – including complete strangers – will hand you a cassette tape at the drop of a hat. This semi-random method (but in fact directed by the hand of God) used by Rinus has resulted in a rich, textured tapestry of information, at times startling in its rough collisions of sonic collage. For example, the creator plays hob with tape speeds (or someone else does), scrambling tapes of pop songs, including the music of The Beach Boys, into processed mayhem. Then the next moment we’ll be sitting besides the waters of a peaceful babbling brook or invited to observe the loud humming of a bumblebee nearby. Through multiple artifices and devices, this is a tape that arrives at a much more “real” reality than many field recordists can manage. 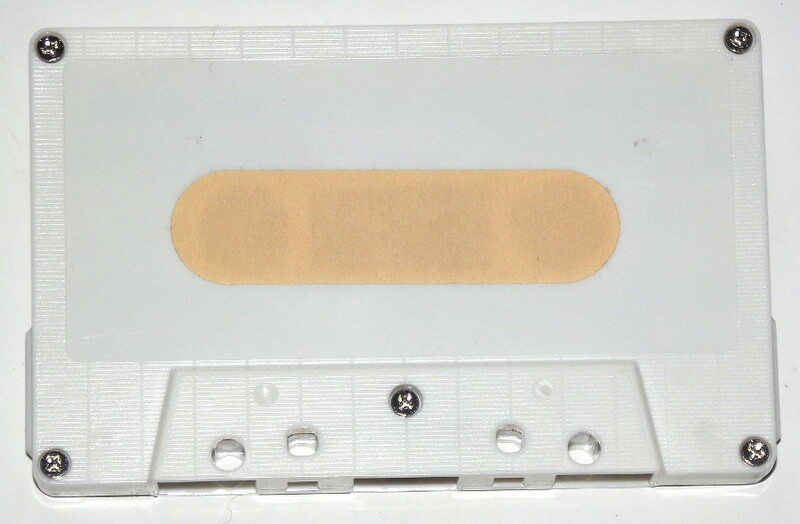 My desire for instant gratification in the playback was delayed even further with this item because I had to remove a sticking plaster from the cassette to play the A side. For some reason this reminds me of a dirty joke where the husband can’t afford to buy a chastity belt for his wife. (Use your imagination for the punchline to this). Maybe this could, in some abstruse manner, tie us back in to the “history behind a French pin-up girl” which Van Alebeek mentions in his hand-written notes. The B side is another layered and fascinating audio jumble, though not as noticeably emphatic with its use of weird, mixed sources. The stress here is laid on the editing method, or sound assemblage, which required several pieces of equipment to be brought into play. Perhaps a Walkman gives notably different textural results to a Marantz or a four-track recorder, in which case Rinus may be throwing out an oblique reference back to Brian Wilson (whose songs appear on the A side) and his growing obsession, in 1966, of picking various Hollywood sound recorders based on the diverse aural nuances they would lend to the singing voices of the Beach Boys. The sounds here of, for example, rainfall, sad and slow piano music, distant radio voices, spoken word fragments, and more rainfall, are edited and juxtaposed with a grace and sympathy that’s bordering on the mystical. Most creators would have to hypnotise themselves in a mirror before they could arrive at the state of omniscience which Van Alebeek is apparently able to summon at will. 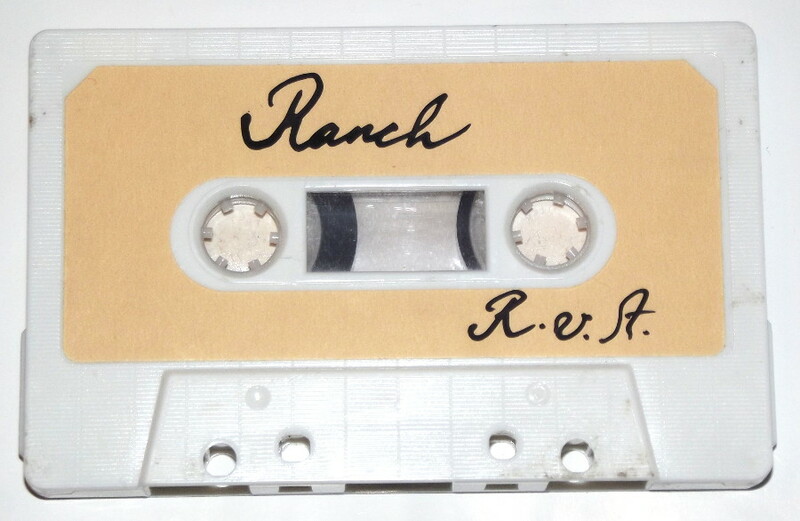 Furthermore, Ranch is released in a tiny edition – only 20 copies, of which I hold #8 before me – and each of these 20 is “differently mixed” to some degree. This probably means that you won’t undergo the exact same experience as this listener, which is a fascinating proposal. It raises questions about the subjectivity of listening to sound or music and what information or emotions we will derive from it at any given time. Another tape, another sticking plaster to remove to expose the spindle holes. This one has the name “RINUS” printed in purple. 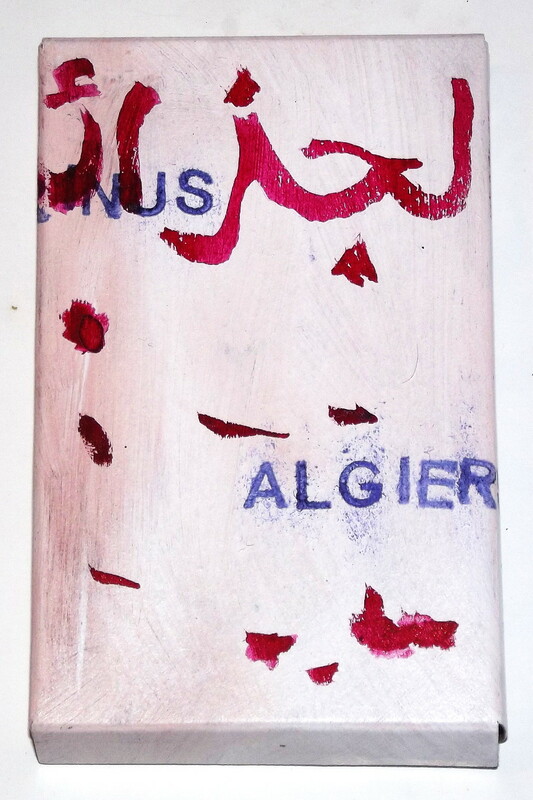 Algiers is another solo tape by Van Alebeek, the cover had painted with thick emulsion paint and decorated with Arabic script in red. 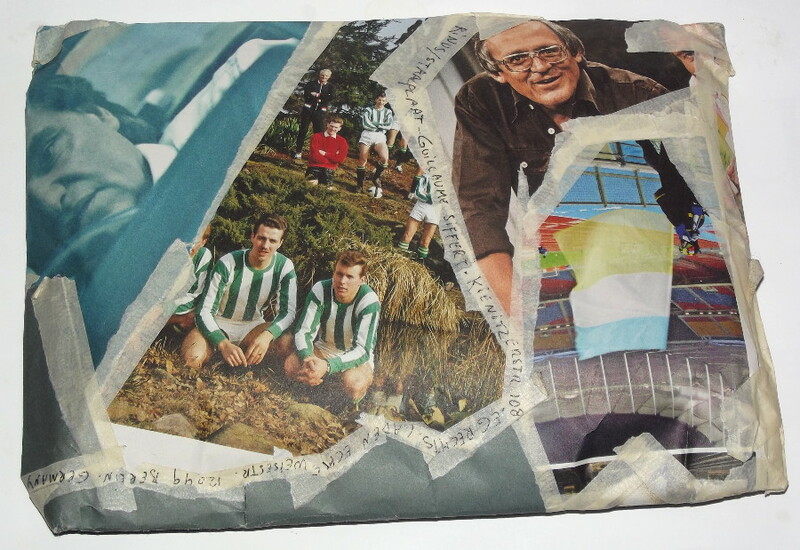 Inside can be found a small hand-made book, cut-ups of pictures from magazines or newspapers, overlaid with yet more cut-ups (or torn strips, to be precise). 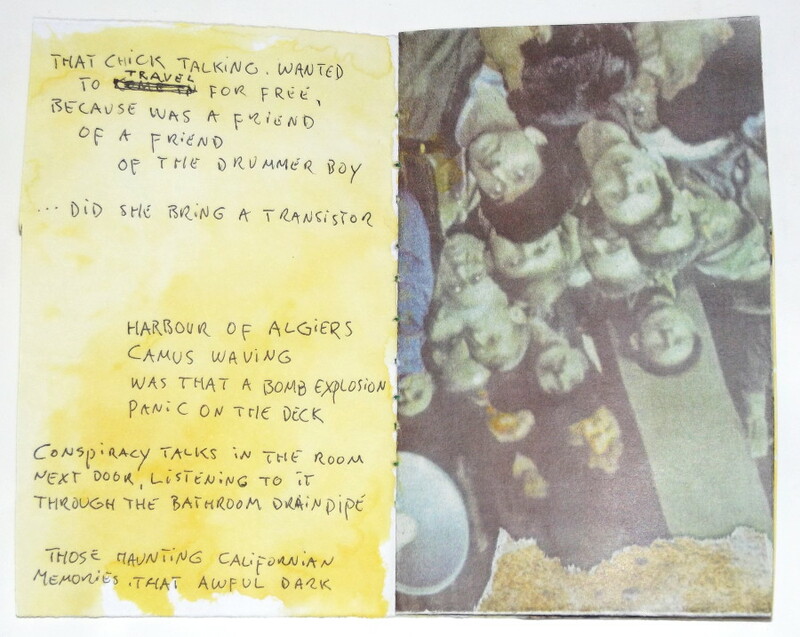 Fragmented diary entries from a travel journal are written in a small close hand on top of a bright yellow watercolour wash. The A side is almost indescribable, a compelling sonic experience…continuous tones…distorted voices murmuring in the lobby of some nameless hotel…an unidentifiable humming…distant music snatches beaming in from a broken TV set…and an occasional screech, rather unpleasant, at times like an ugly crone demanding the rent, but her voice is fed through a reverb technique of some sort. Maybe Rinus is able to create all these effects by semi-natural means. It is refreshing to hear something with none of the over-familiar crunch of digital processing, marring all that’s natural in recorded sound. I have remarked before how RVA – and others in the Staaltape “brotherhood” – adhere to an aesthetic of the “raw and uncooked”. Unlike the previously highly-fragmented Californian works above, this A side presents a very continuous, unbroken picture of something – even if it is comprised of multiple mirror-images, superimposed layers and sonic illusions of depth. The picture is not clear, but it is also not especially pleasant; I’m smitten by a vague sense of lasting dread by this A side, yet am also compelled to keep hearing it to the end, to find what lurks behind the reception desk of this imaginary hotel. This sense of dread only increases as the tape gathers momentum and aggregates its disparate parts into a great ball of ugly noise. “Panic on the deck,” warn the written notes. “Was that a bomb explosion”. Exceptional work, imaginative, strong. If Algiers does present us with distorted views of a decrepit hotel lobby, said lobby feels much more deserted and even a shade calmer on the B side. The TV set or radio still burbles its inane chatter, and a piano in the restaurant wafts gradually towards us in snatches, along with the scent of yesterday’s couscous. There are palpably “open” stretches, as though the tape recorder has somehow managed to capture the traces of guests who departed ten minutes ago. Again, a very continuous picture emerges from the layered and continuous tones, and despite the fact that the quality of vision is far from “limpid”, at least a man can breath in this cool morning air. Indeed the tape gets gradually more washed-out as it progresses, until by mid-point we have only a faint resonance of shopping mall ambience (mostly muffled strains of banal elevator music) to remind us we’re even alive, as we float around the touristy market stalls like Albert Camus’s phantom. Again, this is somehow an extraordinarily heightened experience of reality, presenting a vividness that’s almost dreamlike, in spite of the creator’s strenuous efforts to distance us from everything, via his mysterious movements and allusive remarks. 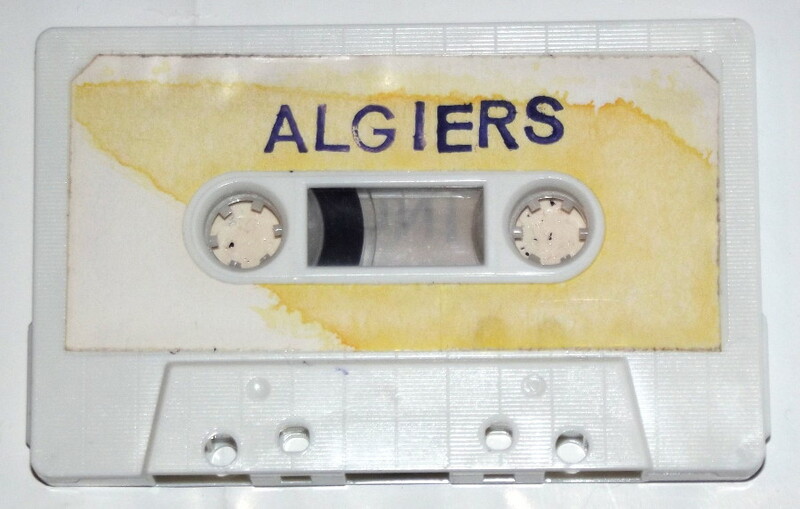 “Conspiracy talks in the room next door, listening to it through the bathroom drainpipe”, he writes, and that poetically descriptive sentence perfectly encapsulates the effect of this Algiers tape. 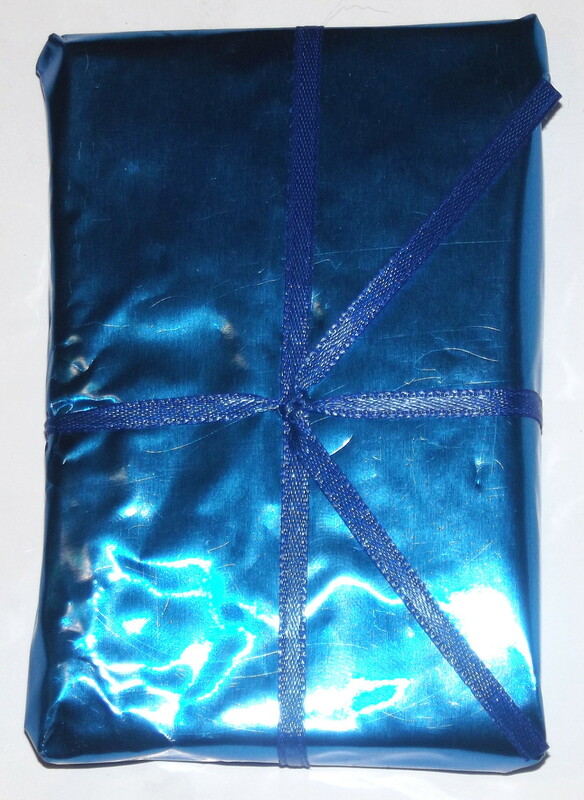 In the blue foil package is Montréal Tape Run, which we already received from the Crustacés Tapes label and is noted here.